Q: Why should I choose a shipping container over a brick and mortar building or other modular structure? A: A shipping container is an inherently cost-effective, strong and secure solution for functional, mobile space - even before modifying it at any level. No other structure can meet that criteria. Learn the 7 reasons why you should choose a shipping container. Q: What can shipping containers be used for? 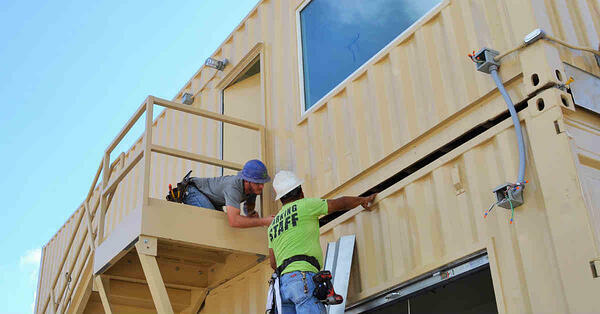 A: Shipping containers can be utilized for commercial, industrial, housing and institutional applications. Uses include storage space, office space, breakrooms, industrial enclosures, workforce housing, hunting cabins and more. Q: Where do the shipping containers come from? A: Falcon has a sophisticated supply chain that enables us to obtain the best containers from all over the world. Q: What types of containers do you use? A: We repurpose used shipping containers. 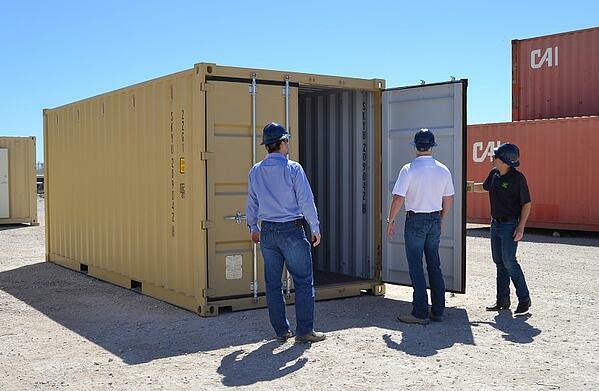 Many of our containers have only been used one time and are in “like new” condition. Q: How do I know I'm getting a quality container to start with? A: When containers arrive at our facility, we ensure they meet our strict criteria for quality prior to beginning any work. If you’d like, you can even visit our location and pick the exact container you’d like us to use. Q: Do you provide products to individuals or only businesses? A: We sell to individuals as well as small businesses, large corporations and government/military. Q: Do you have standard floor plans? A: Yes, we have many standard floor plans for a variety of applications. We offer simple configurations for easily accessing and organizing storage space - including climate controlled storage. For offices, living or other functional space, we have floor plans which have been refined over thousands of projects to reflect what works the best for most people. Contact us for floor plan diagrams. Q: Can you custom design my shipping container? A: Falcon is proud to offer pre-engineered shipping container products with standard options that meet or exceed most requirements. Should additional customizations be required, we’re happy to consult with you to provide a solution. Q: I want more/different windows, doors, etc. Can I add those? A: Falcon can add additional standard windows and doors. Adding windows and doors which are not Falcon standard requires a consultation and could incur additional costs and lead time. Q: Can you provide furniture in the container? A: For loose furniture, Falcon recommends customer self-selection and self-installation. We do offer cabinets, work surfaces, and shelves that are secured to the interior walls. Q: Can I have the unit completely self-contained so I don’t have to hook up to site utilities? For example, using solar? A: Furnishing a container to be self-contained is possible but expensive. Check out our blog on solar power to get a full understanding of the necessary considerations. Q: I want the side hinged so it folds up and makes an awning. Can I do that? A: Usually the containers with upward folding awnings are not actually ISO containers; they're fabricated from scratch to accommodate the structural load of the awning while imitating containers. We exclusively repurpose existing shipping containers, and thus don't create these awnings for safety reasons. If you're looking for a fully opening sides, we can offer you a container built with sidewall doors, like in the adjacent photo. Q: Can I have a rooftop skylight/deck/garden/etc? A: While we do not recommend cutting into the roof of a container, we can and have constructed many decks including railings, ladders and staircases. Q: Can I have the entire side cut out? A: Yes, however, the steel in the wall of a container is integral to its strength. If the wall is cut out, it must be reinforced with steel in order to maintain its shape and sturdiness. Contact us to discuss your project. Q: Can I have granite counter tops or other high-end finishes? A: Falcon’s products have been proven effective in the container environment and are guaranteed to withstand the wear and tear of transportation. Many customer specified interior products or finishes can be accommodated. Often we recommend alternative materials or self-installation once the product is delivered. Q: Do you build custom residential shipping container homes? A: We have standard floor plans for a ready-to-use living environment and a hunting cabin. If you're seeking a larger, custom project, we recommend customers work with a general contractor to manage the assembly and finish-out while we manufacture the container shells. A: Yes, we can arrange delivery of your shipping container. Please contact us for a quote to your exact delivery location. Q: What site preparation do I need to do? A: Standard Falcon floor plans do not require steps, ramps, tie downs, skirting or even a foundation for short term use. Where applicable, connections to power, water, and waste may be required. Additionally, Falcon recommends a level surface for comfort. Q: How do I hook up electrical and plumbing to my unit? A: Electrical and plumbing can both be connected very easily by a licensed electrician or plumber through external portals on the container. Please note that the electrical connection has high voltage, and customers should hire an electrician to safely connect the container to power. Q: I want to start small and add on later. Can I do that? A: Yes. The modular nature of container building is one of its benefits. Read this case study for an example of how phase installation served a previous customer. Q: What building codes pertain to my project? A: All structures are subject to the building codes of the local Authority Having Jurisdiction (AHJ). There will also be variations in code requirements depending on the size and use of your project and whether it's temporary or permanent. 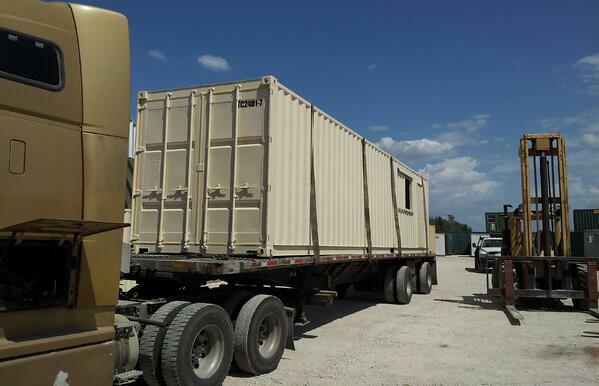 Falcon Structures is a proud provider of AC462 code compliant shipping containers, meaning we can provide containers approved by the ICC-ES for use as building materials. 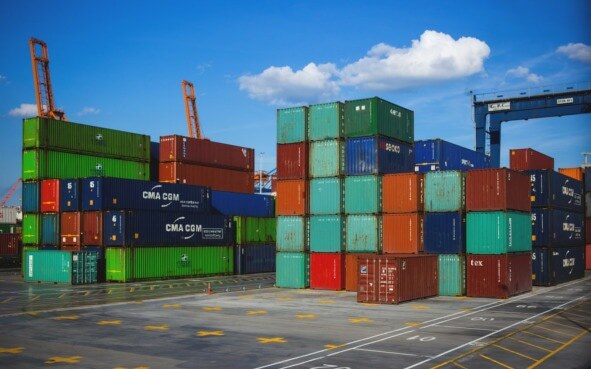 Choosing AC462 code compliant containers will dramatically streamline your permitting process because your local coding official will know that your containers are safe and fit for use as building materials. For guidance specific to your project, contact us. Q: Can I bury it and make a bunker/basement/storm shelter? A: The walls, roof and floor of a container are not strong enough to withstand the pressure from dirt or water. We absolutely do not recommend burying a container to any depth. Read related blogs with container how-tos here. Q: How does Falcon’s ordering process work? A: A quick consultation will allow us to understand your needs and in turn we will provide a quote for your approval. Before production however, you’ll receive and approve drawings to ensure the container is produced to your specifications. Q: How long will it take to fulfill my order? A: The current lead time on a standard floor plan is 4-8 weeks. Any desired changes to our standard plans requires review by our Design and Engineering team. We’ll provide you with a completion time following the evaluation. Q: If I buy in volume, can I get a discount? A: Falcon prides itself on operational efficiency and being able to offer all customers fair pricing. If an order positively impacts to our ability to purchase raw materials from our suppliers, price savings will be passed through to the customer. Q: Can I have an architectural/CAD/3D drawing of a Falcon container? A: We provide Work Instruction drawings for customer approval prior to beginning any work. Please note, there are variations between manufacturers of containers. These variations include corrugation patterns, construction techniques, floor materials, and even exact size. For this reason it is not possible to provide drawings or models beyond the Work Instructions. Q: What if I need repairs to my container? A: If your container remains under warranty, Falcon will handle qualifying repairs. For required repairs outside of warranty, please contact us and we’ll be happy to recommend a qualified repair professional. Still have questions? Ask The Boxpert!